Composite LPG cylinders are a relatively new product within the LPG market and in many countries there isn’t any legislation established for them. Therefore, government agencies reduce the revalidation period until composite cylinders prove they have the same functionality as steel cylinders. This situation varies according to the region and in many countries composite LPG cylinders have the same period for revalidation as traditional ones. However, companies who do revalidation for LPG distributors are concerned about how to proceed with composite LPG cylinders. The process is easier than companies think and in this post we will explain it to you. 2) Hydrostatic Test: this is a standard Hydrostatic Test, the same as can be done for traditional cylinders. 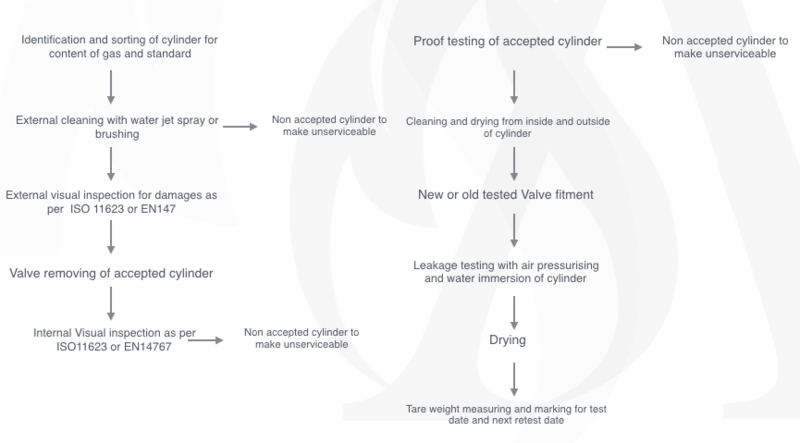 More than one cylinder can be tested at a time provided that they all have the same test pressure and that each individual test point is capable of being isolated. The test pressure shall not be less than 24.5 Bars (25.00 kgf/cm2) as marked generally on the cylinder. A suitable device shall be employed to ensure that no cylinder is subjected to a pressure in excess of 1kgf/cm2 to its specified test pressure. The hydrostatic test once attained shall be held for not less than 30 seconds and during this procedure the pressure gauge used for registering the pressure shall not indicate any drop. While carrying out the inspection of cylinders the external surface shall be totally dried by using compressed air for visual examination of leakage. During the test period the cylinders shall not show any sign of leakage, visible deformation or defect. Any cylinder that fails to comply with the above stated details shall be declared and branded as unserviceable, provided that the drop in pressure as mentioned has not taken place due to leakage in the fixture or the joints. There are advantages by doing revalidation on composite LPG cylinders when compared to traditional steel LPG cylinders. Them main benefit is low cost. Why? because by being composite, if the casing gets damaged, there is no need to throw away the whole cylinder, you only need to replace the casing. Moreover, they are easy to clean and they don’t need to be re painted. Where to do revalidation on composite LPG cylinders? There are different suppliers who can easily do this job for a LPG distributor. However, if you want us to know which one we recommend, please do not hesitate to contact our sales team.